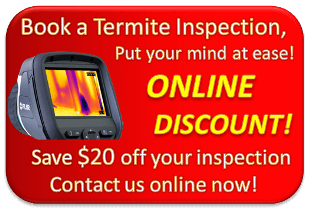 Considering Termite protection for your home? We’ll come to you to discuss the options. We use a range of products to protect homes from termites but for most situations… We use Termidor! This chemical is applied to the soil around your home to keep termites away and provides protection for up to 8 years. Found Termites? See our Termite Treatments page and get in touch with us on 0447 268 257. We can install a series of pipes around your home when we install the termite barrier. Then, when it is time to renew the barrier, the system can be easily pumped up in a short amount of time. This saves you money next time. Baiting is the ideal alternative when the a chemical treatment is not practical or possible. See our Termite Baiting page for more information on this service. When altering the house slab or plumbing, when renovating bathrooms, kitchens or extending the home, Termite protection is often required to stop termites getting in through small faults or joins in the slab. Term-Seal can provide a great solution to sealing the new plumbing or concrete to prevent termites getting in. Term-seal is also chemically impregnated to deter termites. We can provide a Form 16 for Termite Protection for certain aspects of our work when certification is required for new building work. Please inform the technician if you require certification for council approval. Treatment options can be confusing, that’s why we offer a no obligation free quote or just give us a call to talk to a technician.